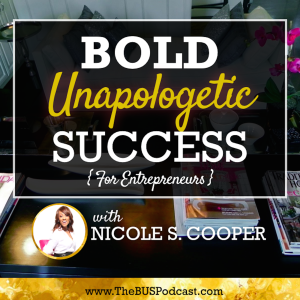 The “Bold Unapologetic Success” Podcast For Entrepreneurs Is Officially Live! This Podcast was designed to focus on intentional success for entrepreneurs who aren’t just out to “Make Money”, but their desire to Create and Establish Successful Careers as Online Professionals. Help You Become Professionally Aligned, Discover Your Voice & Master Your Message! Show You How To Build a 6 or 7 Figure Brand Around Who You Are! Teach You How To Attract The Income You’re Worth & Monetize Your Genius! The Podcast will be released weekly, every Monday morning @ 7am CST, giving you an opportunity to get insight, guidance and direction consistently throughout the week!